MANASSAS, VA--(Marketwire - February 17, 2010) - Aurora Flight Sciences announced today that the DA42M aircraft that will serve as its Optionally Piloted Vehicle (OPV) prototype has arrived at its Manassas, Virginia facility. The DA42M is a 4-place, twin-engine general aviation aircraft produced by Diamond Aircraft in Austria. 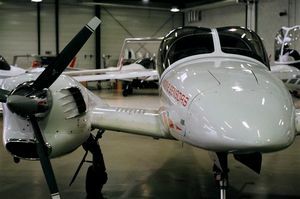 The aircraft that will become the prototype for Aurora's OPV was originally used by Diamond as a prototype for the DA42 Multi-Purpose Platform (MPP) development program. Over the past several months, the aircraft has been upgraded with Austro E300 heavy fuel engines. Aurora's DA42M-OPV, named "Centaur", adds an extensive suite of propriety electronics and software that retains all of the manned mission capability while also enabling the capability to conduct missions with no pilot onboard. This "optionally piloted" configuration is unique to the Aurora version of the DA42M. "The Centaur has roughly the same payload and range performance as the MQ-1 Predator UAV," said Aurora President John Langford, "but it has several important advantages. First, it can be flown with a pilot onboard, which will facilitate operation in the National Airspace System. Second, it has two engines, which gives greater reliability and safety. Third, the Centaur is easily reconfigurable so it can carry a variety of payloads. Finally, it has extremely low operating costs. We see it as a crossover product with enormous potential in many markets." Development of the Centaur began in August of 2009. The Preliminary Design Review was completed last month. Aurora expects to make its first flight in the summer of 2010 and to begin deliveries in 2011. In its manned aircraft mode, the Centaur is intended to retain the DA42's normal-class FAA certification. When operated in the unmanned mode, it is expected to fly under an Experimental certification. The Centaur's planned first mission is mapping the ice pack over Greenland, as part of a NASA experiment being proposed by Harvard's Prof. James G. Anderson. For this mission, a removable "belly pod" housing the radar will be installed underneath the aircraft. An optional nose pod allows other payloads to be installed in the nose. The DA42M-OPV is easily reconfigurable so it can carry a variety of payloads.